If its not good for us, its not good for you. We have been trying out some recipes with family and friends, and are quite happy with the outcome ( cant get the taste of figs, spinach and goats cheese salad out of my mind). Finished an extensive research on different muesli recipes and filtered down to the two below. Now we are inviting you to try and test them yourself at home or simply get your taste buds going......make sure you come and taste it when we open. The best thing about making your own cereal is that you get to add all the things you like and none of the things you don’t. If you can’t find rolled triticale or barley, just substitute rolled oats. My favourite way to serve this is about half muesli mixed with half chopped fresh fruit (grapes are a current winner) and a generous splash of skim milk. It also makes a great crunchy topping to stir through your favourite yoghurt. Mix grains, nuts and seeds together. Remove approx 8C of the mix to another bowl and stir through apple puree & spices. Divide between 2 trays and bake at 150C approx 45 stirring periodically until toasted and dark golden. Allow to cool before combining all remaining ingredients. Pack in airtight containers. Put 5 cups rolled oats into a large bowl. Add 1 cup unsalted sunflower seeds, 1 cup slivered almonds, 1 cup triticale (see above note), 1 cup shredded coconut and 2 tablespoons sesame seeds. Stir to combine. Heat 3/4 cup honey and 4 tablespoons vegetable oil in a saucepan over low heat. Pour the warm honey mixture over the dry ingredients and stir until they are well coated. Spread the mixture on a baking tray and bake for 30 minutes, stirring occasionally. Remove from the oven and allow to cool. Add 1/4 cup finely sliced dried apricots, 1/4 cup finely sliced dried apples and 1/4 cup finely sliced dried peaches (heidi note: I used dried papaya). Toss to combine. 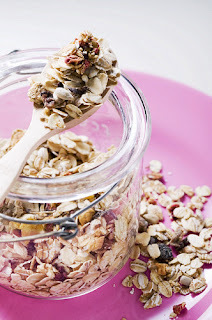 Store the muesli in an airtight container.